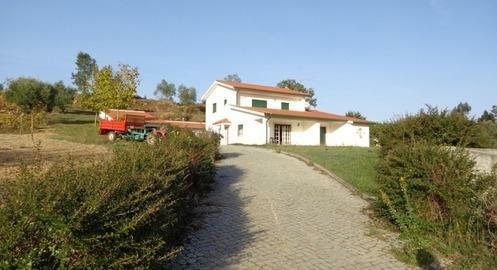 Farmhouse in Coimbra, Penela - Property for sale. Full Description: This is an opportunity to own a farm with over 10,000m2 of land with olive orchards, fruit trees and vines in a wonderful location. The 4 bedroom farmhouse is sited in an elevated position overlooking a small valley with great views of the surrounding countryside. The entrance gates lead to a stone drive that winds its way gently to the farmhouse at the top of the land. Just through the gates is the old mill that now houses the equipment for the 12m x 6m swimming pool. The mill also has a storage area , WC and changing room. At the top of the drive is the garage, which adjoins the Adega bottling room, office/utility room, Adega, WC and tasting room with open fire for those family gatherings and festas. Farmhouse: The entrance to the property is from the gable end that takes you into a half tiled hall with hardwood floor. From here you can access the large open plan kitchen at the rear of the property. The fully-fitted kitchen also has dining area with an exterior door leading to the rear courtyard. Across the hall is the spacious lounge with double doors that take you into the front garden area. The ground floor, which has solid hardwood floors throughout, also contains the master en-suite bedroom and fully-tiled bathroom. The first floor is accessed from the staircase of the hall and has 2 double bedrooms, both with sliding doors. These doors open onto to the 1st floor, front terrace with its wonderful views. There is a third bedroom at the rear of the property along with a fully tiled bathroom. This property is new to the market and was constructed approximately 10 years ago. The vines produce around 600 ltrs of red wine per year and a new olive orchard has recently been planted. The land also has a large vegetable garden area, which is irrigated by the water from the nearby spring. Distances by car: Penela 10 minutes, Coimbra 20 minutes, Tomar 40 minutes, Spain 130 minutes, coastal resort of Figueira da Foz 55 minute. This is a 300k plus property being offered for 245,000 euros in order to promote a quick sale. Viewing is highly recommended. This listing has been viewed 366 times.